A special guest post by Khaled Allen, of Farm to Table Online. As I was starting to get more into Paleo, one of the glaring inconsistencies was the heavy reliance on foods that are only available because of a global food system. Surely, it would have made zero sense for humans to rely on a foods from around the world to get sufficient nutrients for optimal health. How would you get them all in one place? Besides that, it was becoming clear very quickly that the principles behind eating grass-fed meat applied equally to vegetables, namely, only eat what was grown and fed in the way it was meant to be. Eating Ecuadorian bananas in the dead of a New England winter was just as messed up as eating cornfed cows or soyfed chickens. Local, seasonal eating was the obvious answer. Local, seasonal vegetables have a much higher nutrient density than supermarket veggies shipped across the country. They aren’t bred just for durability and shelf-life, so you see a huge variety of strange and colorful items, a literal cornucopia of exotic minerals, nutrients, vitamins, and tastes. Small farmers often meet organic standards, even if they’re not officially certified. They do a hard job with meager financial rewards, so they generally farm out of love and take good care of their animals and land. So you know you’re getting the best possible food in terms of health, and it’s really nice to get your meats and poultry from someone who understands why it’s important to you to know what the animals were fed before they feed you. And for me, the enjoyment I get out of my local food makes it worth the effort. The taste and flavors are mind-blowing (tomatoes that actually contribute to a salad!) and I feel even better now than I did while eating Paleo before going local. The hardest part was figuring out where and how to get all my food; you can’t just stop at the supermarket. For those of you interested in searching out local, sustainable food in your community, read on for some how-to advice on making the transition. Eating locally is a little like being a hunter-gatherer: you have to learn your food landscape, time your hunt just right, and get comfortable with improvising. 1. Farmers Markets. The most straightforward way to get your food is to visit your local farmers market. Check out localharvest.com for a nationwide listing. You can often find grassfed meats, eggs, handmade salsas, and grassfed dairy (if you’re into that sort of thing). Occasionally, you’ll even find seafood if you live near a coast. However, markets are usually the most expensive option. Once you find a farm you like at the market, you can usually arrange to get food from them directly if they are close enough or do direct-shipping. This ends up being cheaper, but adds a bit of hassle and is usually limited to meat and eggs. 2. CSAs. Many vegetable farms do CSAs instead (community supported agriculture). Because of the economics of small farming, it is difficult to coordinate planting with market demand, so farmers offer crop shares, which you buy before the planting starts. The farmer is assured of buyers, and you are guaranteed fresh, local vegetables delivered to a collection point or your doorstep every week. CSA shares are cheaper than shopping at the farmers’ market, and you get a lot of food (and a wide variety of offerings) with your deliveries. I usually have trouble finishing my share by week’s end. 3. Cowpool. For meats, you have two reliable options if you can’t find meat at your market. The first is to join a buying club, or cowshare, like this one. These clubs pool funds to purchase animals, and then ‘hire’ a farmer to raise and slaughter those animals. The economics of this arrangement allow you to get a section of a grassfed cow for sometimes as low as $4/lb, paying a set price for various cuts ranging from low- to high-grade. 4. Delivery services. If you’re lucky enough to live in certain states, you can also get reasonably priced, local meats from a farm-to-consumer delivery service, like Graze (Massachusetts, Connecticut, and New York), Spud (West Coast), or Greenling (Austin, TX). These services aggregate the products of select small farms, with very high quality standards, and deliver to your doorstep on a weekly schedule. 5. Mix and match. The best solution will be a combination of these – maybe a CSA or delivery service for staples, with occasional trips to the market for fresh vegetables, and a cowshare for your years’ supply of meat. (A freezer is a necessary investment if you want to really leverage the economics of local eating). I know what you’re thinking: “It was hard enough getting over all that bread and pasta, and now you want me to only eat things I can find within 200 miles, and in season? !” So let’s be realistic about your foray into local, sustainable eating. 1. Not everything can be local. First of all, you won’t get everything locally. Some things (like oils, nuts, chocolate, coffee and other delicious things you shouldn’t be eating much of anyway) can be considered specialties. You probably won’t find these items locally, so accept that you’re going to have to make some accommodations. 2. Start with meat and veggies. Staples, such as meat and vegetables, put a higher burden on the food system, and they make up the bulk of your calories, so if you make those local (which is luckily much easier), you’ll be making huge progress, and a solid contribution to your local economy. 3. Eat seasonal. You’ll have to get used to missing berries in the spring and fall, and gorging on them in summer. Squash is out of season in the spring and summer, but you’ll get lots of succulent leafy greens to make up for it. When the fall comes around, you’ll be ready for the deep, satisfying flavor of the gourds, when their unique nutrient profile is most needed by the body (like any animal, we too have seasons when certain foods serve us better than others). Whole9’s Seasonal Produce Guide can help you set appropriate expectations. 4. Get creative with fats. The biggest problem for Paleo-types will be finding local fats and oils. Local olives and coconuts are rare. You can ask your local meat farmer if they can spare you the lard or tallow from their butchering process, or you can settle for buying your cooking oils at the grocery store as usual. Nut farms are limited to the South and California. You could mail-order nuts from small farms; it’s not local, but it still supports sustainable farming, and you’ll get fresher, more nutritious nuts and seeds than anything you’ve ever tasted before. (You’ll be amazed at the difference: check out pastureraised.net if you want to go this route). 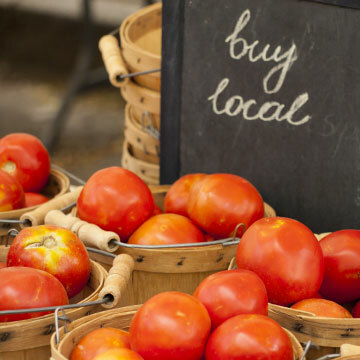 The best way to start eating locally is replacing some foods with local ones. Vegetables are the easiest option. Start in the summer, and get to know your farmers at the market. Browse local health food stores and co-ops, and talk to the owners and vendors. And check the labels before buying produce in your normal grocery store, avoiding items imported from other countries. Once you’re comfortable with the sourcing options, try branching out to meats (often, via the same sources as above), and then specialty items. Before you know it, you’ll look down at your dinner plate and realize you know exactly where everything on it came from. It’s a good feeling. And once you get a taste for local, you won’t ever want to go back. Khaled Allen runs the local food blog, Farm to Table Online, and is an active CrossFitter. He is currently teaching English in South Korea while training to be a ninja. If you live in Fairfield County, CT; Weston, MA; or Wellesley, MA; or visit Stratton, Stowe, Sugarbush and Okemo mountains during ski season, Graze is offering a free entree (up to a $20 value). Visit http://www.grazedelivered.com/ and use the code Whole9 at checkout. Fill out the form below to join the Whole9 Newsletter. I live in MO and we have nut farms here too – actually, I hand pick the nuts that I eat in November. Living in the Midwest gives me a lot of great opportunity to eat local and I have the fortune of being able to easily obtain wild and grass fed animals directly from the farmer/hunter. Not to mention, my city has a very large farmers market (it feels like you travel back in time going to that place, pretty neat). Eating locally is by far the cheapest way to eat, truly making paleo eating much cheaper than any other style of eating, I’ve discovered. But, I’m still working on staying seasonal. At our farmer’s market, we also get access to produce brought in from other parts of the world at local prices because of the competitive nature of the place. I mean, by 3 o’clock, stands are trying to out sell each other and you can get cases of things for a dollar, it’s pretty nuts. I never realized there was a benefit nutritionally to eating in season and locally. That’s definitely motivation to think about what I’m buying. First off – great article, Khaled. This is the exact type of article I was looking for this morning and I was lucky enough to find it on my first stop, the Whole9 blog. Awesome. Second, your bio mentions that you are training to be a ninja, that fires me up! @casey: That sounds amazing! Local nuts, meats, and a huge farmers market. Sounds like paradise to me. I’ve never actually managed to get local nuts, and the freshest nuts I’ve had came from a speciality foods distributor that got them from a small farm. Seasonality is definitely tricky, but once you get into it, it’s interesting how your tastes sync up with the time of year to crave the right foods as they become available. It sounds like it should be easy for you. I want to add for anyone in Alaska or Washington to check out Full Circle Farms Delivery, they are certified organic boxes of produce and have other “green grocer” items one can purchase with many choices for how big of a box and rate of delivery. Hey Khaled- really good and useful information. Thanks so much for sharing. Food sourcing can be a confusing topic to a lot of us and you were able to really simplify it. @WEFA sorry to hear it’s so difficult. With the food industry geared towards discouraging local, healthy eating, it is really a problem when other things don’t support it as well. If you want some ideas for ways to make it easier and cheaper and other resources and support, Farm to Table has articles by bloggers and local food leaders all over the country. If you send me an e-mail there I’ll see if I come up with some helpful resources. @chuck: glad to be of help! I know how tricky it can be to make work, having tried to eat local-paleo in some really awkward circumstances (while working as a summer camp counselor, when I had exactly 1 hour a day to myself when I could get my own food and prepare it). Once you get the hand of the system, it can run pretty smoothly, but you have to do more legwork than with supermarket food. Great post with some great creative ideas. It’s important to remember to shop in different ways. Living in the desert the seasonal produce can be quite limited so it can be a challenge. But do what you can and it all helps! Love this! Last year, I’ve started really making choices not only to eat healthy but taking greener choices. You wouldn’t find me in a local market but now I make sure I buy most of my vegetables and fruits from our local farmers. @jj: Thanks for that tip! I’ve actually never heard of rendering chicken fat as a regular source of fats, though thinking about the results of making stock I always do end up with a lot of fat. I’ve always just boiled it back into the stock, but this solution makes everything taste like fried or roasted chicken, which as you point out, is awesome! @Jeff: yes definitely just do what you can. Sometimes you can find locally sourced food in the most unlikely places. Ask around. Sometimes small grocers or restaurants source stuff locally but don’t advertise it. You can always start your own projects too, like community gardens or farm shares. Khaled, don’t just skim it off your soup! Google “making schmaltz”. Next time you break a chicken down into pieces for stew or something, save all the skin. Then you render the schmaltz out from the skin a pan over low heat. Not only does it result in a nice clear cooking fat, you get these YUMMY chicken skin chips out of the deal! Hmmm… I might just need to pull out my tupperware of frozen skin out of the freezer and make some today. Again though, I get pastured chickens from a provider that uses a no-corn feed mix. An industrially produced chicken probably doesn’t have the greatest fatty acid profile. And they’re expensive enough that I really go beak to tail on them, the feet make awesome stock. @jj: we don’t skim it just boil it back in to the stock if it cools and comes out. Your suggestions sounds much tastier though. At the moment, I don’t have anywhere to get pastured chickens, or any way to verify, since I’m living in South Korea and can’t understand Korea labels, but I was wondering if you’d like to write up a little article for farm to table on utilizing chicken fat. It’s definitely something our readers would be interested in learning abou in detail.